The Antichrist, though mentioned a mere four times in the Bible, and then only obscurely, has exercised a tight hold on popular imagination throughout history. This has been particularly true in the U.S., says author Robert C. Fuller, where Americans have tended to view our nation as uniquely blessed by God--a belief that leaves us especially prone to demonizing our enemies. In Naming the Antichrist, Fuller takes us on a fascinating journey through the dark side of the American religious psyche, from the earliest American colonists right up to contemporary fundamentalists such as Pat Robertson and Hal Lindsey. 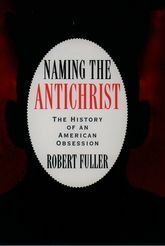 Fuller begins by offering a brief history of the idea of the Antichrist and its origins in the apocalyptic thought in the Judeo-Christian tradition, and traces the eventual 71Gws how the colonists saw Antichrist personified in native Americans and French Catholics, in Anne Hutchinson, Roger Williams, and the witches of Salem, in the Church of England and the King. He looks at the Second Great Awakening in the early nineteenth century, showing how such prominent Americans as Yale president Timothy Dwight and the Reverend Jedidiah Morse (father of Samuel Morse) saw the work of the Antichrist in phenomena ranging from the French Revolution to Masonry. In the twentieth century, he finds a startling array of hate-mongers--from Gerald Winrod (who vilified Roosevelt as a pawn of the Antichrist) to the Ku Klux Klan--who drew on apocalyptic imagery in their attacks on Jews, Catholics, blacks, socialists, and others. Finally, Fuller considers contemporary fundamentalist writers such as Hal Lindsey (author of The Late Great Planet Earth, with some 19 million copies sold), Mary Stewart Relfe (whose candidates for the Antichrist have included such figures as Henry Kissinger, Pope John Paul II, and Anwar Sadat), and a host of others who have found Antichrist in the sinister guise of the European Economic Community, the National Council of Churches, feminism, New Age religions, and even supermarket barcodes and fibre optics (the latter functioning as "the eye of the Antichrist"). Throughout, Fuller reveals in vivid detail how our unique American obsession with the Antichrist reflects the struggle to understand ourselves--and our enemies--within the mythic context of the battle of absolute good versus absolute evil. One of my favourite books of all time. I had to read this one in university and it completely engaged me and still does after the tenth read through. Fuller traces the American historical culture, intertwining it with this concept of the antichrist. An antichrist that has little to no actual existence in the bible itself. Essentially the connection between America and this concept is a form of a justification of violence. The use of the antichrist model allows Americans, more specifically American government to " demonize the enemy", and thus justify violent action against said enemy. With the huge ties between American history and a religious pretext, American governments can use the excuse of fighting for god. Seems ludicrous but fuller outlines how this has been done since before the American revolution. Hugely recommended read for anyone interested in American history, religious or not. Fantastic read.